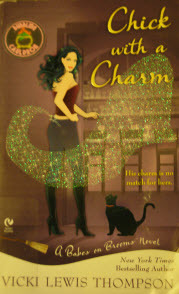 Chick with a Charm, by Vicki Lewis Thompson, is the sequel to Blond with a Wand. This one stars Anica Revere’s sister Lily in her quest to find someone take to her Anica’s engagement party. Enter Griffin Taylor, a divorce lawyer hottie. He claims that his job and his parent’s own divorce has turned him off of romance. Lily thinks otherwise. So…with the help of a little magic potion mixed into a Harvey Wallbanger cocktail, we see all the possibilities. Vicki has created another fun and flirty book with this one. Be prepared though…there are a number of “racy” scenes in this one. So if you’re on the prim and proper side of things, you’ll want to skip the read. As for me…I loved it. One of my favorite parts in this book is the introduction of Anica’s and Lily’s parents. Fresh from researching herbs and such in Peru, Lionel and Simone Revere, they come complete with dorky costumes and parental advice. Let’s not forget Dorcas and Ambrose either. We will meet them again later in another book on my “to read” list. Read Blond with a Wand first and then read Chick with a Charm. Perfect for all your October/Halloween reading!